Universal. Released November 21, 1931. 71 minutes. The Annotated Frankenstein. “Frankenstein” by Mary Shelley, Notes by Leonard Wolf. Clarkson N. Potter, Inc. 1977. page xii. She finished the novel over the next year and published it anonymously in 1818. The reviews were mixed, but largely good, and when it was revealed that the author was a woman opinion was that it was even more remarkable. The novel which began life in such a strange way spawned a monstrously large brood of offspring. There have been so many different versions of the story, from the brilliant “Bride of Frankenstein” in 1935 to the Hammer films of the 1960s, to “Andy Warhol’s Frankenstein” in 1973, up to the film “I, Frankenstein” slated for release in 2014 and so many, many others – Hollywood, foreign, re-makes, re-imaginings, parodies, musicals, tv mini-series, cartoons, even “Jesse James Meets Frankenstein’s Daughter” in 1966. Whether they were wonderful, awful or somewhere in –between, there have been a lot of them. Could Mary possibly have imagined or believed such an outcome on that wild Geneva night when she dreamed the germ of her book? Even though it is a bit hard to believe, I’m sure that even in this day and age there are many people who have never seen this film. If you have seen the movie, please enjoy what I have found out about it. If you have not, I hope this spurs you to buy it, rent it, steal it, borrow it from your best friend – whatever you have to do. 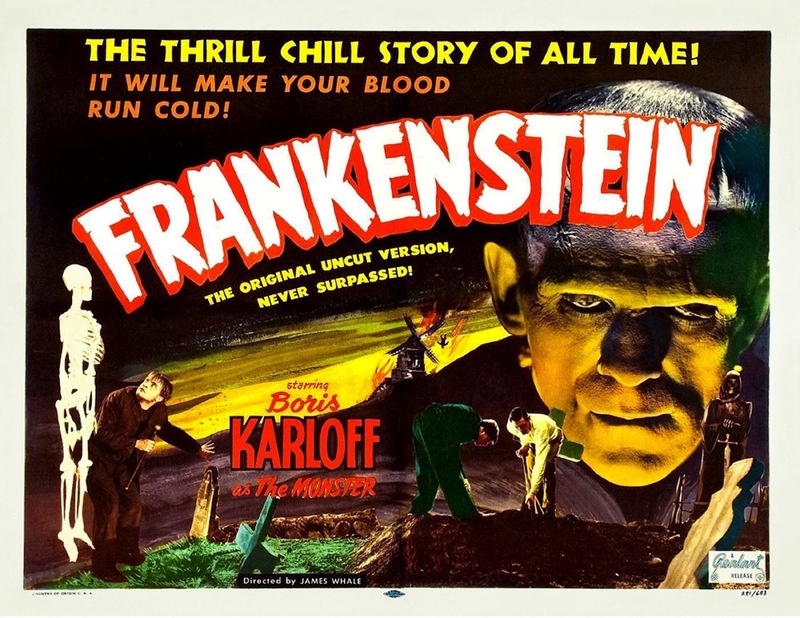 It is not as terrifying today as it was on its original release, however, like the creature who is constructed by Henry Frankenstein from parts of dead bodies, the film is even greater than the sum of its already impressive parts. Each piece – the beautiful set design and lighting, the active direction, the impressive acting, the moving photography, the tight script, all bring together an experience that will move you, if you give it a chance to that is. Just put out of your mind whatever big budget waste of time you saw last week. The film clip at the top of this page is the very first thing you see at the beginning of our movie, even before the opening credits. 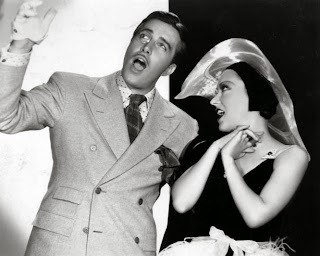 The actor, Edward Van Sloan who plays Dr. Waldman in the film, steps in front of a theater curtain and addresses the audience. He speaks as himself, not Waldman, and says he is delivering his “word of friendly warning” at the behest of “Mr. Carl Laemmle” (whether it was Junior or Senior Laemmle is not specified.) He warns that what the audience is about to see will no doubt be so horrifying that people should be prepared in case they don’t feel strong enough to take the shocks. Van Sloan also played Dr. Van Helsing in Universal’s previous 1931 hit film of “Dracula”. At the end of that movie he stepped out of character and delivered a curtain speech which begins with the hope that the audience will not be plagued by nightmares when they go home after the horrors they just witnessed. However with a twinkle in his eye he ends that speech with “…after all….there ARE such things!” The “Dracula” speech is both a reassurance and a final shiver. (Unfortunately, that bit of film was censored and removed from the film and is still lost.) The “Frankenstein” pre-curtain speech echoes the "Dracula" piece in its winking style but is more titillating. It was tacked onto the final film after the previews and was written in part by future director John Huston. 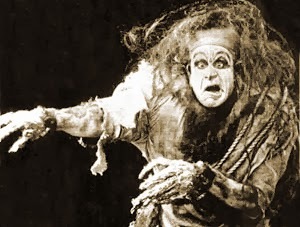 -- 1910’s Edison 16 minute production “Frankenstein” was lost until a print was discovered in the 1970s. It starred Charles Ogle as the Creature and was directed by J. Searle Dawley. The story ends with the Creature confronting Frankenstein who slumps unconscious into a chair. The Creature sees his own reflection in a mirror, and overcome with grief and horror, disappears. This version brings to mind the German legend of the Dopplegänger – the Double – perhaps the Creature and Frankenstein are almost a Jekyll/Hyde pair. 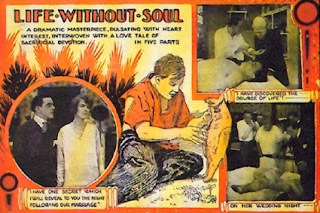 -- Ocean Film Corporation filmed a feature length version in 1915 entitled, “Life Without Soul”. The basic story essentially is familiar and some of the character names have been retained from the original novel. In this version scientist Victor Frawley creates a liquid to restore life to the dead. An abnormally strong and horrifyingly brutal Creature is created, which as in the novel forces Victor to create a mate for him in the same fashion. Victor does this, but he destroys her in order to protect a helpless world from the possibility of their monstrous progeny. 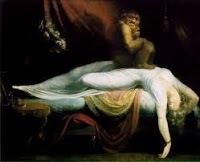 The monster kills Victor’s bride Elizabeth on her wedding night, as well as Victor’s sister, and his friend Clerval. It all turns out to be a dream and on waking Victor destroys his magic elixir before actually using it. This is a lost film; only a few stills are extant. 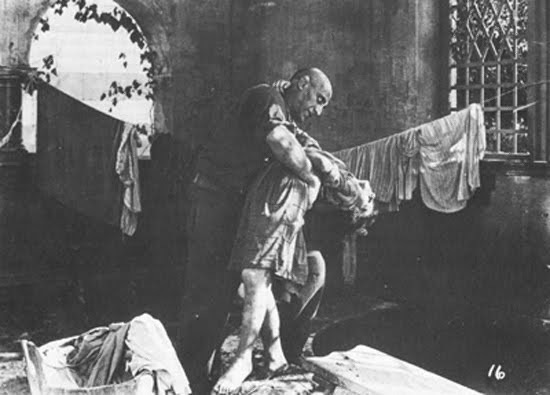 -- an Italian production in 1920, “Il Mostsro di Frakestein.” This is a lost film, nothing of it exists today other than one or two stills and a few Italian theater posters. 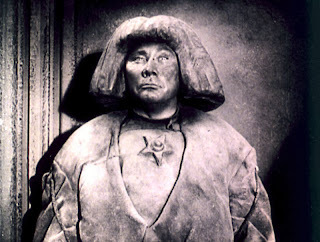 The Creature was played by Italian strongman Umberto Guarracino who also appeared as a man-beast in the 1921 German film “Die Insel der Verschollenen,” an unauthorized version of H.G. Wells’ novel The Island of Dr. Moreau. Dr. Frankenstein was played by Luciano Albertini ,a handsome former circus trapeze artist who became the most popular silent film star in Italy. Umberto Guarracino doing his stuff. In 1930 Richard Schayer, head of Universal’s story department, brought in director Robert Florey who suggested Shelley’s tale as a project. It was assigned to Florey for a script treatment and he understood that he would direct. Just as Bram Stoker’s novel “Dracula” had been thought to be un-filmable since it was comprised of a series of diary entries and newspapaper reports, Shelley’s sprawling and deeply philosophical novel presented a challenge. It had been adapted into a stage play by John Balderston and Peggy Webling and in 1930 Universal spent $20,000 to purchase the screen rights (the novel itself had been in the public domain for years). The play was never performed in the United States, per Universal’s stipulation. In 1950 Balderston and Webling sued Universal for a larger slice asking for an additional 1% of the earned gross of the first film and the seven sequels. That would have made a pretty tasty slice since the final cost of the original film was $292,000 and it made $12 million on its first release alone. Three years later the suit was settled for Balderston and the estate of Peggy Webling to receive $100,000 but Universal retained the rights to the characters. Years later, Robert Florey stated that he never even looked at the play when he started work on his script treatment. He worked from the novel, and managed to whittle down the mammoth story into slender, manageable form for the time and budget sensitive film project. Florey discarded the continent hopping scenes, and he made the creature mute thereby removing the lengthy moral and philosophical discussions. 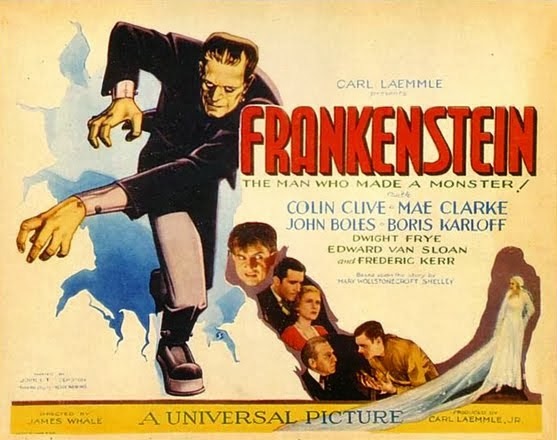 He added the scientist’s assistant Fritz and he placed Frankenstein’s lab in the windmill – when the film was made this was changed to the mountaintop watchtower but the Creature still drags Frankenstein up into the windmill for the climax which explains a curious continuity glitch in the script: when the Baron is told that his son is too busy with his experiments to attend his own wedding, the Baron says “why does he go messing around in an old ruined windmill…” Florey also added the idea of the switch of the normal/abnormal brains. When Fritz steals a criminal brain for the doctor’s use, it explains the Creature’s murderous behavior later on, whereas in the novel he becomes violent only after he has been abandoned by his creator and mistreated and attacked by everyone who sees him. This test footage is lost to this day and is one of the most sought after pieces of cinema. Lugosi’s makeup was created by him (possibly with Jack Pierce) and was much different from the final Karloff look. The face was clay-like and the hair was huge, supposedly not unlike the makeup effect for Paul Wegener’s look for “The Golem” in 1920. Studio execs were not pleased, to put it mildly, with this interpretation so Lugosi was out. Lugosi stated that he was the one who walked because he was a star and did not want to play a grunting creature under a ton of makeup. Who knows? At any rate, Lugosi and Florey both were replaced. Robert Florey was unhappy about being canned but realized that his contract with Universal stipulated merely that he would direct one picture; not which picture it would be. He was given “Murders in the Rue Morgue” as a consolation prize, with Lugosi in the lead. Additionally his name was removed from "Frankenstein"s final story credits. The script was re-written (but leaving in most of Florey’s ideas) by Francis Edwards Faragoh who included some humorous bits at James Whale’s suggestion. The name Garett Fort is also included in the screenwriting credits – he worked on dialogue with Robert Florey. Thus we have some of the most confusing and convoluted writing credits in the history of movies. James Whale was a successful theater director in England and was brought over to Hollywood to work with the new system of sound and the actors who now had to speak intelligibly on film. He directed the dialogue scenes for Howard Hawks’ 1930 “Hell’s Angels” and then guided the film version of “Journey’s End”, the WWI drama which he directed on the London and New York stages. He had already achieved great commercial and critical success when he contracted with Universal in 1931. The WWI drama “Waterloo Bridge” was his first project there and was another success. Studio chief Carl Laemmle Jr, offered Whale his choice of scripts with Whale choosing “Frankenstein”. He liked the artistic possibilities of the story and felt it would guarantee that he would not be thought of as a “WWI director” alone. Of the thirty or so stories available it was the strongest meat and gave me a chance to dabble in the macabre. I thought it would be amusing to try and make what everybody knows is a physical impossibility believable for sixty minutes. Also it offered fine pictorial chances, had two grand characterizations, and had a subject that might go anywhere. John Brosnan. The Horror People. St. Martin’s Press, Inc. 1977. pg 69. Ironically even though Whale’s work was widely varied – his films included comedies, dramas, melodramas, mysteries, historical costume pieces and musicals – he was pigeon-holed to history as a “horror” director for the four films he directed which can be described by that genre– “Frankenstein”, “Bride of Frankenstein”, “The Old Dark House” and “The Invisible Man”. For the role of Henry Frankentein actor Leslie Howard was considered, but Whale wanted and got Colin Clive. Clive had starred in “Journey’s End” both on the London stage and in the film version. His sharp, aristocratic face and his sensitively neurotic manner were perfect for the scientist who tempts the anger of the gods. Clive always suffered from debilitating stage fright and early on started to take a drink before going onstage. Unfortunately that turned out as it does so often, the habit grew to an illness – an illness which one could see eventually in his face. By 1935’s “Bride of Frankenstein” alcoholic dissipation is clearly marked and Clive looks older than his years. He died much too young in 1937 at the age of 37. The studio wanted Bette Davis, who was briefly under contract with Universal, to play Elizabeth, but Whale insisted on his star from "Waterloo Bridge", Mae Clarke. The actress (born Mary Klotz in 1907) started her career as a cabaret dancer at the age of sixteen, and within two years was playing small roles in musical theater. A vivacious flapper, Clarke was the inspiration for the character of Lorelei Lee in Anita Loos’ “Gentlemen Prefer Blondes”. Her screen debut was in 1929. In 1931's “Waterloo Bridge” she played the lead character Myra, a woman who supports herself as a prostitute, and gave a performance of genuine warmth, fragility and strength. 1931 was a busy year for Clarke; she made not only “Waterloo Bridge” and “Frankenstein”, but shone as Molly in “The Front Page” and famously had a half grapefruit shoved in her face by James Cagney in “The Public Enemy”. She gives Frankenstein’s fiancée Elizabeth sweetness as well as a noble depth of character. Elizabeth appears to be in love with Henry’s friend, Victor Moritz, however she is faithful to and supportive of Henry at any cost. Mae Clarke having grapefruit served a la cart by James Cagney in "The Public Enemy"
Victor Moritz is very obviously in love with Elizabeth, but remains a steadfast friend to both she and Henry. He is played by Universal contract player and up and coming leading man, John Boles. Born in Texas in 1895, he attended the University of Texas intending to become a physician but became interested in theater instead. WWI intervened and Boles served in an espionage unit in Germany, Bulgaria and Turkey. After the war he studied acting and singing, eventually cast in Broadway musicals for his deep baritone voice. In Hollywood he started in silents but later found plenty of work as a romantic leading man in sound films. With Gloria Swanson in "Music in the Air" 1933. 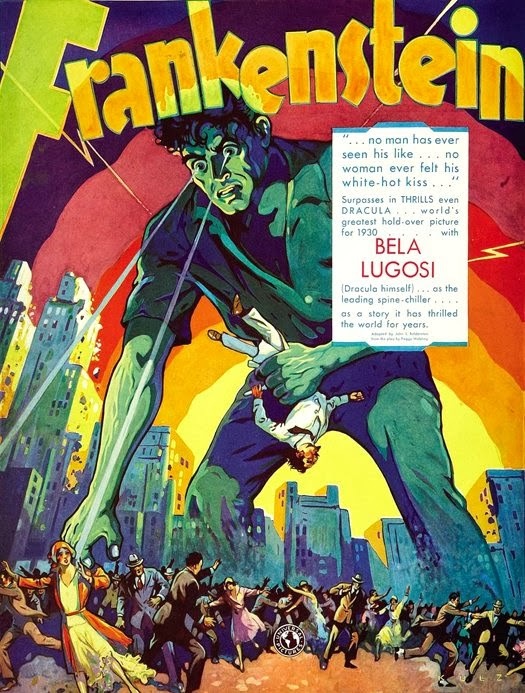 In “Frankenstein” he had a typical role – pleasant, solid, and boring. The final main character to be cast was the Creature. 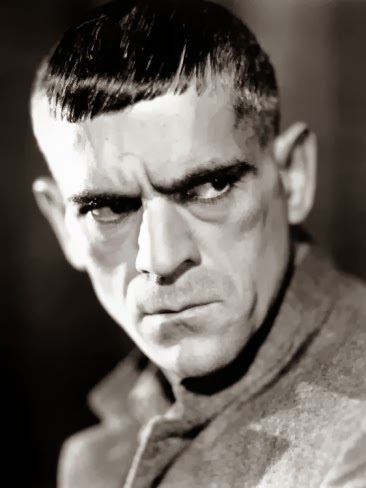 Producer David Lewis, Whale’s friend and lover, stated that he recommended contract player Boris Karloff after seeing Karloff’s work in the film “The Criminal Code”. Whale was struck by Karloff's deep set eyes and the shape of his head and face. John Brosman. The Horror People. St. Martin’s Press, Inc. 1977 page 44. Born in 1887 as William Henry Pratt in London, Karloff was one of nine children and one of three who did not join the diplomatic corps. His interest in theater made him the black sheep of the family and so he emigrated to Canada. After a back-breaking and unprofitable six months as a farmer, he tried a variety of jobs to earn a living – digging ditches, laying railroad track – before trying theater again. 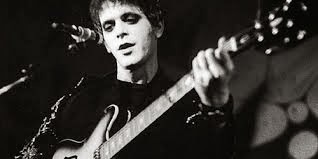 He decided that the name Pratt did not suit an actor and took the name Karloff from his mother’s side of the family and made up the name Boris. Karloff moved to Vancouver, found an agent, and presented himself as being much more experienced on stage than he truly was. His first professional job was a disaster but he stayed on with the company playing small parts on tour throughout Canada. Over the years he learned his trade but still worked during the lean times as a laborer or truck driver. In 1917 he arrived with a theater company in Hollywood and Boris eventually started being cast in bit parts, working up to small featured roles. By the time he was cast in “Frankenstein” at the age of forty-three, he had appeared in over eighty films. Makeup artist Jack P. Pierce, former jockey and baseball short stop, was born Janus Piccoulas in Greece in 1889. He came to the US in 1910 and eventually started working for the movies as projectionist, cameraman, actor and assistant director. He was hired by Universal in 1926 to work in makeup and eventually became department head, creating some of the most unforgettable monster makeups of all time. His techniques were ground-breaking but also time consuming. Seeking to use more economical modern methods, Universal unceremoniously dumped him in 1947. He went on to work independently in films and television. He died in 1968. Pierce took James Whale’s sketches and created one of the most remarkable monster makeups in history. 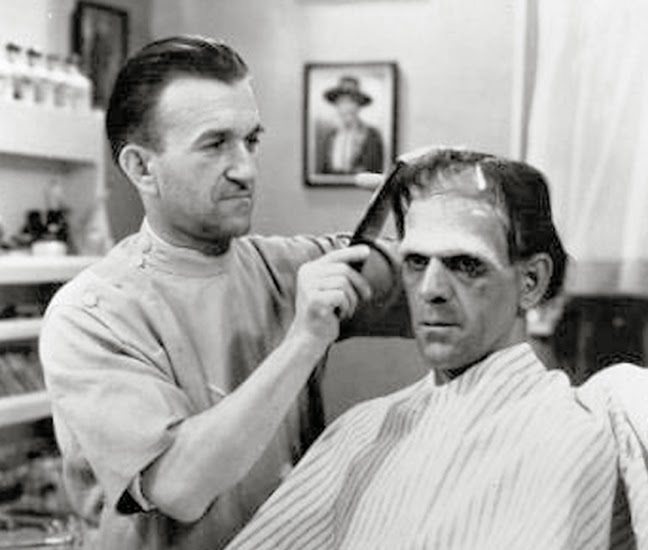 Remarkable not least because of the time it took to create, apply and remove and the physical pain Karloff suffered throughout. Pierce stated that he studied anatomy and surgical texts to determine just how the Creature should look. The high forehead was built up painstakingly with layers of spirit gum, cotton, makeup, collodion (a smelly, liquid plastic) over and over until the heavy brow was created. The flat top of the skull was Pierce’s idea that Frankenstein, not being a practiced surgeon, would use the easiest way – slice off the top, remove the old brain, pop in the new one and clamp the whole thing shut. Karloff made the suggestion that the Creature’s eyes looked too open and aware, so Pierce created pieces of heavy rubber to weigh down the eyelids for a droopy, half dead look. After working on the makeup effects for six weeks, a test reel was made and shown to James Whale who was delighted with the results. Shooting started on August 24, 1931 on the Universal lot. The first scene starts with a reverent graveyard ceremony. The priest is saying his final prayers over the casket, the bell-ringer is tolling the dirge, the mourners are weeping and paying their last respects. The camera moves across the scene, over the tilted monuments to two figures hiding behind a metal fence. They are the hunchback Fritz and the scientist Henry Frankenstein, both waiting impatiently for the ceremony to end. As the mourners depart, the gravedigger, who has been waiting a discreet distance away, now moves to his work. Taking off his jacket, spitting on his hands, he shovels the first clod of dirt into the grave. It hits suddenly with a deep, resounding echo (Whale put a microphone inside the casket to increase the sound). When he finishes filling the hole, he lights his pipe, casually throws the match onto the grave, turns and we see his patched vest as he hoists his implements onto his shoulder and returns home, probably to a hot supper after a day’s work. Frankenstein and Fritz quickly undo the gravedigger’s work, shoveling the dirt anywhere and everywhere, even into the face of the statue of the Grim Reaper. They finally remove the casket and take it away on their cart. In one brilliant scene we have moved from the ethereal to the ordinary, from the religious to the blasphemous, from heaven to earth in a very literal way. Death has been reduced from something sacred and final, to something to be overturned and disregarded. After these dark scenes in the graveyard we move to Castle Frankenstein, where Elizabeth has called on Victor to help her. She has received a letter from Henry telling her to stay away so he can finish his great work. She is frightened and determined to bring him home safely. Victor, always the gallant gentleman, agrees to help her. The camera has connected Henry, Elizabeth and Victor somehow, and we find out the details in the conversation between Victor and Elizabeth. Only then does the camera pull back to show us the stately yet comfortable room. The set ends just about where the chandelier is, the space above is a matte painting. Note the large bowl of flowers on the left - a Whale decorative touch. He could hardly film a room without flowers in it. This is a definite change from the novel in which we are told nothing about the brain Frankenstein uses in his experiment. We assume that it is probably perfectly normal, so the murders which the Creature commits are solely because of how he had been cruelly abandoned and tortured. Nurture, not nature was to blame in Shelley’s book. We next see Fritz enter the lecture hall at night and steal a brain for his employer. After a comic moment - another Whale touch, injecting humor into tension - when he backs into a display skeleton, he drops the ‘normal brain’ and so grabs the other one and scuttles out the way he came in. Oops. "Normal brain", "abnormal brain"...big deal. He'll never know the difference. Elizabeth and Victor convince Dr. Waldman to accompany them to Henry’s mountaintop lab to persuade him to leave his experiment and come home. Henry sends Fritz down to the main door to tell them to go away. On his way back upstairs, Fritz pauses to pull up his sock – another comic touch, evidently improvised on the spot. Just because you're a hunchback doesn't mean you can neglect your appearance. You only have one chance to make a first impression! He gave his creations imaginative and meaningless names such as, “Lightening Bridge” and “Nucleus Analyzer”. He also created the electrical arc machine for the 1931 film, “The Mask of Fu Manchu” and stood in for Boris Karloff who refused to be near the equipment when it was running. Kenneth Strickfaden (L) in costume as Fu Manchu, standing in for a nervous Boris Karloff. Actor Charles Starrett standing to the right. 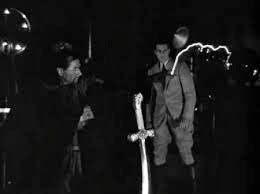 Universal spent $10,000 on the electrical effects for “Frankenstein” but gave Strickfaden no acknowledgement in the credits. The equipment was used again in “Bride of Frankenstein”, “Son of Frankenstein” and in 1974 Mel Brooks finally gave Strickfaden credit when the equipment was used in “Young Frankenstein”. At the end of the creation scene Frankenstein utters the line, “In the name of God, now I know what it feels like to be God” which was to give censors fits, though not at first. That particular blasphemy was ok until the film’s 1938 re-release. By that time the Production Code was in full and fulsome effect, so the hammer came down on anything remotely controversial, adult or even thoughtful. The line was cut and replaced by a thunder clap. I can remember watching the movie as a kid and thinking it sounded a little clunky, but then, what did I know? The line was finally replaced when a complete sound recording (separate from the film itself) for the movie was discovered in the 1970’s. Note a very small detail: in the lab when Frankenstein is talking to Fritz before the actual bringing to life business, he holds the Creature’s arm up to show the stitching. The skin is very, very dark. But later, after being brought to life, the Creature’s skin looks pale but more normal. I don’t think this is my imagination; I think this was done on purpose to show the contrast between the dead skin of the pre-animated corpse and the living tissue later on after the spark of life has been instilled. It can't be the lighting because Frankenstein's skin looks normal. What do you think? The next most memorable scene is probably when the Creature is finally revealed. The scene begins with Frankenstein and Waldman talking about the Creature, and the scientist is told that the brain he used is abnormal. We begin to hear footsteps outside the door. Frankenstein turns out the light, the door opens and…in a marvelously theatrical presentation the Creature backs into the room, building our suspense. He turns slowly and his face moves from shadow to light in a series of close-ups that had people screaming and jumping out of their seats. While the Creature is roaming the countryside, he comes upon Little Maria – a small girl playing by the lake waiting for her father to come home. This is probably the third most famous (or infamous) scene in the film, and the most heavily censored, right from the start this time. Maria shows no fear of the Creature and takes his hand to lead him to the lakeside to play a game of throwing flowers into the water. It is two innocent souls sharing a fleeting moment of joy and we see the Creature smile for the first and last time. At the first preview of the film, the audience was shocked and confounded by this and there was some laughter which ruined the mood. Universal founder, papa Carl Laemmle, Sr. was also shocked, and exclaimed, “No little girl is going to drown in one of my pictures!” The scene was cut at the point the Creature is reaching for Maria. Unfortunately, this led to a much more disturbing and sinister outcome in the minds of many who watched the movie over the years. Did the Creature molest Maria and then kill her? That was not answered until many years later when the scene was restored to its original form. Seven-year-old Marilyn Harris plays Little Maria with great naturalness. 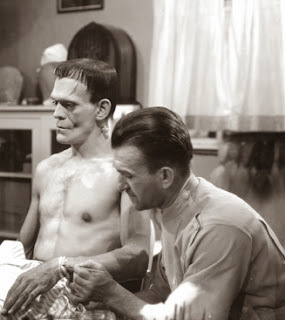 She remembered later that she was able to watch Karloff being made up as the Creature, so never had any fear of him. The first take of her drowning didn't work, as she did not sink into the water as required. Harris had to be taken out, dried and her hair redone for a second take. Whale recalled that he got her to do the whole thing over again with a bribe. Harris was kept on a constant diet by her stage mother, and so when Whale asked her what she would like to have of anything at all, her reply was for a dozen hard boiled eggs. The second take was perfect, and she got her eggs. The Creature eventually crashes the wedding party and confronts Elizabeth in her room. When the door is broken down, Elizabeth is found sprawled across her bed, in shock. The well-known 1781 painting, “The Nightmare” by Henry Fuseli may have been Whale’s inspiration for the composition of this shot. Henry joins the search party looking for the Creature. In this still you see how the Universal lot was made to look like mountain scenery. Sort of. The vertical lines in the picture are not in the transfer, they are in the painted background. The effect is highly artificial and we can wonder about why that was left in. However, the artificiality adds to the nightmare fairy tale quality of the entire film. Finally, Creator and Creation confront each other. Henry is knocked out and carried to the old windmill, followed by the torch bearing mob. As the Creature screams in blind panic, Henry wakes up and tries to escape. As we see the two faces alternate in the turning mill wheel, we can wonder how much of the Creature is part of his Creator, and vice versa - another reminder of the Doppelgänger theme. Henry has come face to face with his responsibility, and his fate. The Creature hurls Frankenstein from the top of the windmill, and he falls into the crowd, presumably dead. Robert Florey’s original script ended with Frankenstein dead, having been shot by Little Maria’s father in the confusion of the mob. However, even though morality may call for the neglectful and irresponsible scientist to be made to pay for his hubris, the preview audience begged to differ. A final scene was shot to allow the audience to see that Frankenstein had indeed survived and was married to Elizabeth. We see the old Baron toasting the couple, as we see the two young lovers in the background of the room behind him. Colin Clive and Mae Clarke were not available for the re-shoot, so stand-ins were used. Frankenstein was played by actor Robert Livingston, star of many Western B-movies. The Baron toasts, “A son to the House of Frankenstein!” as the maids second this, and we have our happy ending. Though not considered so scary today, “Frankenstein” was considered gruesomely horrific at the time of its release. Nothing like it had really been seen up to that point. 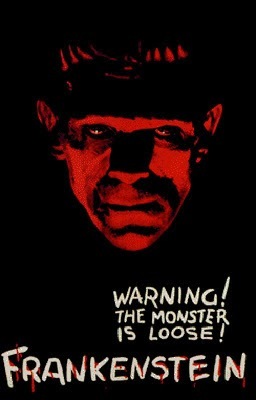 Boris Karloff created a sympathetic and complex human creature with whom we can identify- his confusion, his innocence, his fear and panic, his isolation and attempt to reach out for friendship with Maria, and then his rage and lashing out at his absent creator. Karloff demonstrated a heretofore unseen talent for mime in his facial expressions (particularly incredible considering the amount of makeup) and the pathos when he reaches up to the light and then out to his Creator as if for an explanation of his Great Mystery – who am I? why am I here? Questions we all ask. 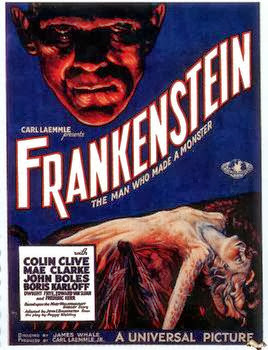 Karloff finally got his name in the credits at the end of the picture, and became a star. When the movie was re-released on a double bill with "Bride of Frankenstein" the re-shot happy ending described above was clipped. "Bride" begins with the old windmill still burning and Henry's body being brought back to the castle. Everyone believes he is dead, until he moves and Una O'Connor lets out one of her ear piercing screams to point out that the Master is indeed still alive. So, "Frankenstein" had to end with Henry dead at the bottom of the windmill so "Bride" could have its logical start. Make sense? Good. 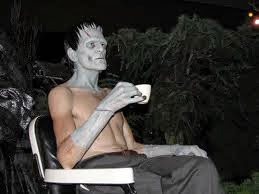 I was offered one (a monster role) and turned it down. I turned down Frankenstein. I wasn't going to play the monster. I was from the the-a-tuh." Here are some excerpts from the New York Times review by Mordaunt Hall, December 5, 1931. Out of John L. Balderston's stage conception of the Mary Shelley classic, "Frankenstein", James Whale, producer of "Journey's End" as a play and as a film, has wrought a stirring grand-guignol type of picture, one that aroused so much excitement at the Mayfair yesterday that many in the audience laughed to cover up their true feelings.